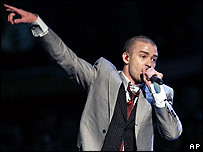 Justin Timberlake won the race for the top of the UK album chart with his new release Futuresex/Lovesounds. He beat indie band the Fratellis, who had a new entry at number two with Costello Music, and former Fame Academy contestant Lemar at number three. The previous top album, Snow Patrol's Eyes Open, fell to number four. US band the Scissor Sisters remained at the top of the singles chart for a second week with I Don't Feel Like Dancin'. Timberlake also has the number two single with Sexyback, which was a previous number one. The only new entry in the singles top 20 were The Killers at number five with When You Were Young, taken from their forthcoming album.